From Middle English colour, color, borrowed from Anglo-Norman colur, from Old French colour, color, from Latin color, from Old Latin colos (“covering”), from Proto-Indo-European *ḱel- (“to cover, conceal”). Akin to Latin cēlō (“I hide, conceal”), Old English helan ("to conceal, cover, hide"; see hele). Displaced Middle English blee (“color”), from Old English blēo. More at blee. Also partially replaced Old English hīw (“color”) and its descendants, which is less often used in this sense. Compare also Dutch kleur (“color”), Danish kulør (“color”), Swedish kulör (“color”), Old Norse kólorr (“color”). In the US, the spelling color is used to match the spelling of the word's Latin etymon, and to make all derivatives consistent (colorimeter, colorize, colorless, etc). Elsewhere in the English-speaking world, the spelling colour has been retained. (countable) A particular set of visible spectral compositions, perceived or named as a class. (uncountable) Hue as opposed to achromatic colors (black, white and grays). (uncountable) Human skin tone, especially as an indicator of race or ethnicity. (figuratively) Interest, especially in a selective area. (heraldry) Any of the standard dark tinctures used in a coat of arms, including azure, gules, sable, and vert. Contrast with metal. (in the plural) A standard or banner. 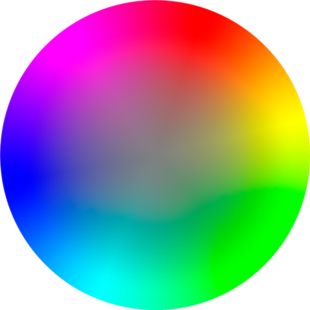 The system of color television. (in the plural) The flag of a nation or team. (in the plural) Gang insignia. (in the plural) An award for sporting achievement, particularly within a school or university. (military, in the plural) The morning ceremony of raising the flag. In corporate finance, details on sales, profit margins, or other financial figures, especially while reviewing quarterly results when an officer of a company is speaking to investment analysts. (physics) A property of quarks, with three values called red, green, and blue, which they can exchange by passing gluons. (finance, uncountable) A third-order measure of derivative price sensitivity, expressed as the rate of change of gamma with respect to time, or equivalently the rate of change of charm with respect to changes in the underlying asset price. (typography) The relative lightness or darkness of a mass of written or printed text on a page. (snooker) Any of the colored balls excluding the reds. A front or facade: an ostensible truth actually false. An appearance of right or authority. (medicine) Skin color noted as: normal, jaundiced, cyanotic, flush, mottled, pale, or ashen as part of the skin signs assessment. The late Anglo-Norman colour, which is the standard UK spelling, has been the usual spelling in Britain since the 14th century and was chosen by Dr. Johnson's Dictionary of the English Language (1755) along with other Anglo-Norman spellings such as favour, honour, etc. The Latin spelling color was occasionally used from the 15th century onward, mainly due to Latin influence; it was lemmatized by Webster's American Dictionary of the English Language (1828), along with favor, honor, etc., and is currently the standard US spelling. In Canada, colour is preferred, but color is not unknown; in Australia, -our endings are the standard, although -or endings had some currency in the past and are still sporadically found in some regions. In New Zealand, -our endings are the standard. Conveying color, as opposed to shades of gray. (transitive) To give something color. (transitive) To cause (a pipe, especially a meerschaum) to take on a brown or black color, by smoking. (intransitive) To apply colors to the areas within the boundaries of a line drawing using colored markers or crayons. (of a face) To become red through increased blood flow. To affect without completely changing. (informal) To attribute a quality to. (mathematics) To assign colors to the vertices of (a graph) or the regions of (a map) so that no two adjacent ones have the same color. From Old Occitan color, from Latin color, colōrem, from Old Latin colos, from Proto-Indo-European *ḱel- (“to hide, conceal”). From Old Latin colos, from Proto-Indo-European *ḱel- (“to hide, conceal”). From Old Occitan color, from Latin color, colōrem. From Latin colōrem, singular accusative of color, from Old Latin colos, from Proto-Indo-European *ḱel- (“to hide, conceal”).